This article originally appeared in The Conversation. It was written by Don Brushett, Research Associate at Southern Cross University. Coffee roasters and barista schools have produced many impressively complex charts plotting grams of coffee against volume of water overlaid with concentration and yield. In the middle is the ideal weight/ volume/ concentration yield target for the perfect cup of coffee. Here is a little graphic of my own that I will use to describe what happens when we change our four variables. On the horizontal axis we have relative time, on the vertical axis the numbers represent amount. The curves are extraction profiles. Caffeine is very water soluble and the vast majority of the caffeine is extracted early. The volatile oils, which give coffee its complex flavour and aroma, extract more slowly. The organic acids, which make coffee taste bitter, are extracted the most slowly of all. So let’s go through each of our four variables in turn. The coarseness of the grind and the extraction time are inextricably linked. The finer a coffee is ground, the more surface area there is. Conversely, the larger the grind, the smaller the surface area. Let’s consider the two ends of the extreme. 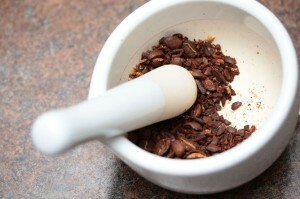 If we grind coffee as fine as talcum powder we have maximised the surface area available for extraction. Therefore, we can very quickly extract the target compounds – but perhaps too quickly for some people’s tastes. Turkish coffee is very finely ground and boiled. This produces a coffee which is very strong and bitter and because of the fineness of the grind often contains a lot of suspended solids (muddy). The finely ground material may block filters too, causing the extraction to go on for too long – or not allow the water to pass through at all. At the other end of the spectrum, let’s consider whole coffee beans. Of course, given enough time, we can extract unground coffee. This is quite wasteful of the coffee beans because the hot water may not penetrate all the way to the interior of the bean, so we throw away unextracted material. Obviously, the optimum grind (coarseness) is somewhere between these two extremes, where we match the residence time of the hot water (flow rate) across the ground coffee beans with our ideal caffeine/ volatile oil/ organic acid ratio. If you get a cup of coffee produced from a quality bean but it is too weak and insipid, the coffee may have been ground too coarsely. If the coffee is unacceptably bitter, perhaps the grind is too fine, with too-high levels of organic acids being extracted. Let’s hold all of our variables except temperature constant and see what happens. As with our coarseness experiment let’s consider the two ends of the extremes. Temperature strongly influences solubility and rates of extraction. Yes, you can extract coffee with ice water. The three curves on our graph above get pulled to the right, so given enough time we can extract a decent cup of coffee. 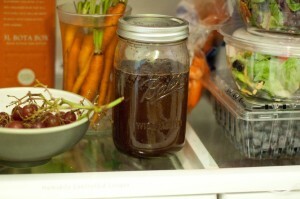 Cold brew coffee is made this way – ground beans are placed in cold water and allowed to “brew” in the fridge for up to a day. The solubility of caffeine is moderately affected by temperature and the solubility of the organic acids is strongly affected by temperature. We would expect that a coffee brewed using this method would be lower in caffeine and much lower in bitterness than a coffee brewed using hot water. Now, let’s extract our coffee using boiling water. The curves on our graph get scrunched up on the left-hand side. Everything gets extracted much quicker and the margin for error becomes much smaller if we try to limit bitter organic acid content. Another complicating factor is that our volatile oils are just that – volatile. If we boil coffee, our flavour and aroma compounds get carried away in the steam. This can produce a coffee that is weak in taste, yet high in caffeine and organic acids. Let us keep our coarseness, temperature and water-to-coffee ratio variables constant and only consider the time variable. 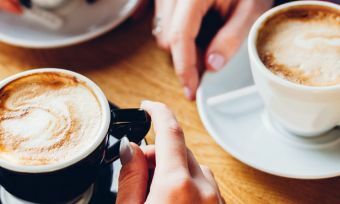 If we consider the ideal cup of coffee is one that has maximum caffeine and maximum volatile oils while limiting the bitter organic acids, we would consider 4 on our arbitrary timescale to be just about perfect. 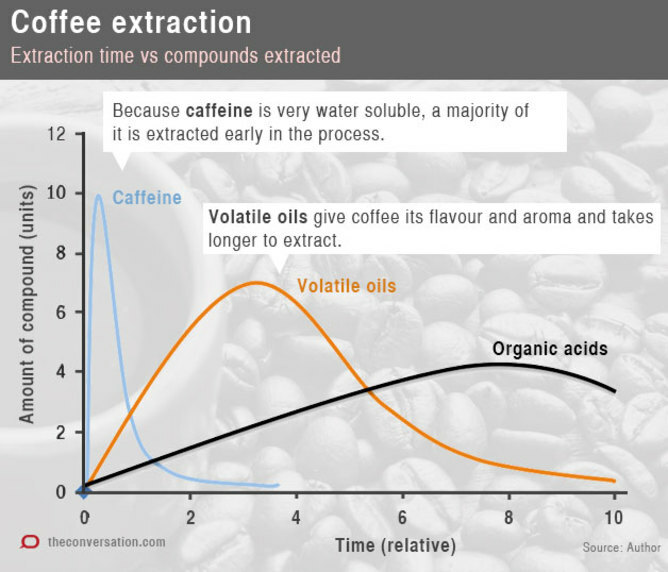 If we only extract to 2 on the timescale we will have a coffee high in caffeine but weak, or underdeveloped, in flavour, aroma and bitterness. If we extract for too long, say to 8 on our timescale, our coffee will contain high amounts of organic acids, which can make it unacceptably bitter. This brings us to our coffee-to-water ratio – perhaps the most subjective of all our tests. Too little coffee and even with all our variables optimised the coffee will taste weak. Too much coffee and the resulting brew will be too strong and overpowering. in modern espresso machines the volume of water can be changed to taste. Generally, the water temperature is maintained within the machine at around 97C. Too little water and the coffee is weak and underdeveloped; too much water and the coffee is bitter. The generally accepted rule of thumb for the coffee-to-water ratio is approximately 10g of coffee to 200mL of hot water. One heaping tablespoon is about 15g, give or take a gram or two. So there you have it. Optimise the coarseness of the grind, match this with the water temperature and the extraction time and make sure your coffee-to-water ratio is in the right ballpark. 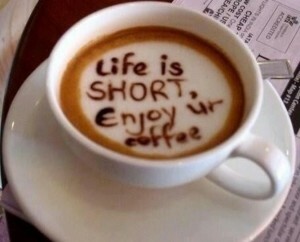 Or you can go down and visit your friendly local barista, have a chat, and let them do the thinking for you.